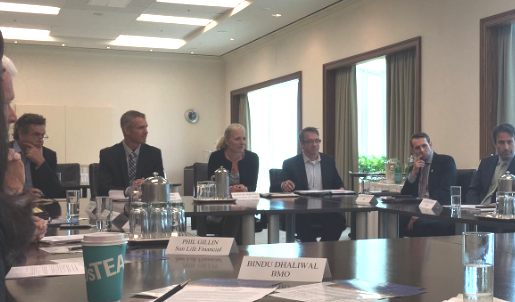 On July 14th in Toronto, The Delphi Group and the GLOBE Series hosted a roundtable between the Honourable Catherine McKenna, Minister of Environment and Climate Change and representatives from leading companies in Canada’s financial sector. Mike Gerbis, CEO of The Delphi Group and the GLOBE Series, gives us the run down. The meeting with the Minister was the third in a series of industry-government roundtables convened by Delphi and GLOBE Series, following sessions in Vancouver in March (at GLOBE 2016) and in May. What is clearer than ever is that leading Canadian companies – who historically have found ways to reduce their impacts on the climate ahead of federal policy – are keen to partner with government as a means to action. Government – which needs the cooperation of the private sector to achieve its international obligations – is also keen to build on existing efforts and to support industry as it makes decisions that can dramatically affect the emissions profile of the country. Canada’s low-carbon future will be a story about innovation, clean growth, and sustainable prosperity. The Government of Canada intends to put forward the clear, long-term policy necessary to incent investment. The financial sector has a critically important role to play in enabling this transition and in ensuring that Canadian businesses remain competitive. How can insurance companies, banks, and pension funds help the Government of Canada transform the economy – how can they help reach Canada’s climate objectives while ensuring opportunities for growth and investment? How could the Government of Canada and the financial sector best work together to accelerate investment in programs that will support the transformation to a low-carbon economy, e.g. energy retrofits in commercial buildings, clean technologies, etc.? What kind of instruments could help incent investment in these programs, e.g., tax policy, loans, loans backing, etc.? As a result of all three of the roundtables, industry representatives have a greater understanding of the federal government’s commitment on climate change. If you are a senior decision maker or a sustainability lead at a company, the more information you have regarding policy priorities, the better you can plan for the future. The need for a national innovation strategy that not only spurs innovation, but significantly enhances the commercialization, deployment and export of Canadian clean technologies so they can grow and prosper here at home. Canada is at a historic moment for progress on the climate change issue. Never before have we experienced the type of alignment we have between governments (federally, provincially and municipally) on this issue. Companies are more engaged than ever. And society is better informed and more tuned into action than at any other time in our history. Given this confluence of factors, we at Delphi and GLOBE Series are tapping into our strengths – our subject matter expertise, our networks, our convening power – to catalyze progress on climate change. This issue requires an unprecedented amount of collaboration in order to get the solutions in place that can support economic growth AND environmental progress. We’re doing everything within our powers to accelerate that collaboration and turn it into action.